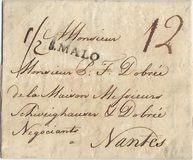 1845 Entire addressed to St Malo from Guernsey showing on the front a very fine ILES-C/ST MALO cds and Handstruck '3', SG CF 38. Ex Jay. 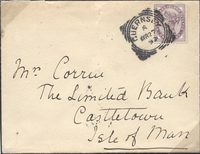 1886 2½d Lilac, SG 190, tied to envelope from Guernsey addressed to France by a very fine ST MALO ILE ET VILAINE cds. Ex Jay. 1870 3d Rose, SG 103, Plate 5, tied to envelope to France by a very fine JERSEY 409 duplex, SG JC 38 and showing a superb JERSEY CIRCULAR-FRAMED 'PD', SG CF 89. 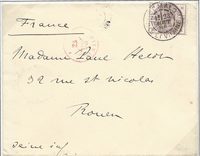 1866 4d Vermilion, SG 94, Plate 7, tied to Entire addressed to France by a very fine St Malo 3734 gros chiffres in black. 1814 Cover to London showing a fine "GUERNSEY." SCROLL, SG GC 4. 1839 Entire from Jersey to "A Alençon" showing on the front a very fine OUTRE-MER GRANVILLE cds in Red, SG CF 34. Ex Jay. 1923 Postcard from France to Jersey underpaid and with a POSTAGE DUE 1½d CHESTNUT, SG D 3 applied, tied to card by a JERSEY CDS. 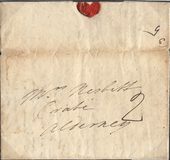 1834 Cover from Rio de Janeiro to London "Pr Dolphin" showing on the reverse a fine rectangular-framed GUERNSEY/SHIP LETTER, Robs S2. 1870 French 40c Orange tied to Entire from St. Malo addressed TO GURNSEY AND CANCELLED ON ARRIVAL BY A VERY FINE GUERNSEY/324 duplex, SG CF81. VERY SCARCE. 1870 Envelope to Tulicorin, India and redirected. Franked by NINE 1d Rose-Red, SG 43, Plate 112, tied by very fine GUERNSEY '324' numerals. 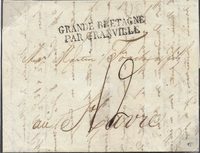 1816 FORWARDING AGENT COVER FROM NANTES TO GUERNSEY FORWARDED BY "LOUIS BLAIZE ST MALO". 1903 Postcard from Guernsey to Reigate, Surrey with a FOREST/GUERNSEY Datestamp in CRIMSON. Very Scarce. 1806 Cover from GALWAY to GUERNSEY showing a very fine London SUNDAY CIRCULAR DATESTAMP for 'AUG/24/1806' in red, L27. RATES CHANGED FROM '7' TO '1/8' AND THEN TO '2/1'. 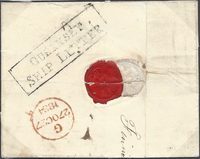 1850 Entire from JERSEY addressed to NANTES, France showing a very fine ILES-C/St MALO circular datestamp in Red, CF38. Postage Due 14 decimes - double rate for 8gm letter. Ex B Jay. 1852 Envelope from JERSEY via SOUTHAMPTON-LONDON-DOVER-OSTEND-ANVERS showing "ANGLETERRE PAR OSTEND I5 SEPT" cds on reverse and a very fine Handstruck '6' decimes Postage Due, CF43. Ex B Jay. 1827 Entire from JERSEY to "AU HAVRE", France showing a very fine "GRANDE BRETAGNE/PAR GRANVILLE", CF8. Rated 12 decimes comprising Jersey to Granville Sea Postage 6 decimes and French Inland Rate 6 decimes. 1829 Cover to Towcester showing a fine scroll-framed GUERNSEY, SG GC5. 1799 INTER-ISLAND Entire to GUERNSEY showing a fine concave JERSEY, J1. Postage 2d. Ex B Jay. 1815 Type 1 'JERSEY." 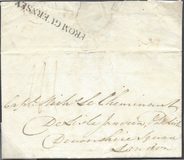 Scroll on Wrapper addressed to GUERNSEY. Letter rate between Jersey and Guernsey "2", JC4.